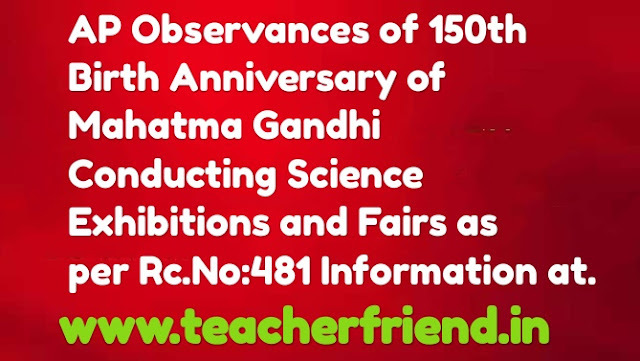 AP Observances of 150th Birth Anniversary of Mahatma Gandhi Conducting Science Exhibitions and Fairs Submit the details plan and schedule etc., within 10 days as per Rc.No:481/2018, Dated:13/07/2018. Govt. Memo No 18026/ III/2018-General, date:25-6-2018 along with its enclosures. The Director, SCERT / Regional Joint Directors of School Education /District Educational Officers are informed that, the Director, Dept. of School Education. MHRD, GOI, New Delhi has stated that. GOI has taken the following decisions in connection with the 150th Birth Anniversary of the Mahatma Gandhi and the Mahatma Gandhi International Sanitation Convention - 20th October. 2018. "The Vigyan Melas being organised may attempt to foam, on the topics of swatch Bharat Miedon, Water Conversation and promotion of Solar Energy". Further, the Director. DSEL has requested to include the above theme in the Science Exhibitions and Fairs to be held in the schools on the occasion and the details of the plan and schedule of the events be forwarded to department immediately. 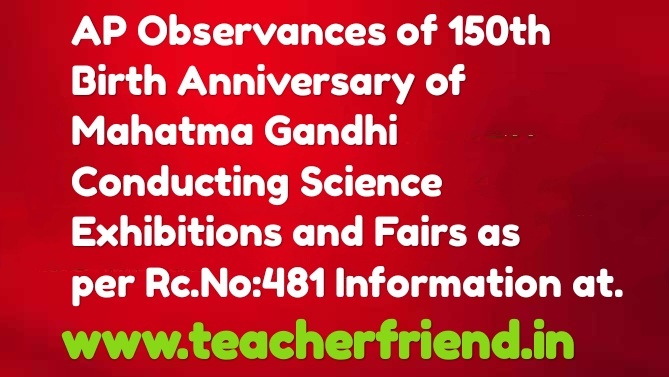 There fore, all the Regional Joint Dire sagl PAG all District Educational Officers the State are requested include the above I eme in the Science Exhibits and fairs to be held in the oats on the ace of Mahatma Gandhi Birth day and submit details of the plan and schedule of the events within 10 days from the date receipt of these proceedings to the Director, SCERT, A.P., immediately, so as to consolidate and submit the same to MHRD, GOI, New Delhi. The Director, SCERT is also requested to provide necessary guidance to all DEO. in the State as per the directions given by the Director, Dept. of School Education, MHRD, New Delhi and collect all details / plans / schedule of events/ fairs and consolidate and submit the same directly to the Director, DSEL, MHRD, GOI New Delhi within 10 days as requested. These instructions should be followed scrupulously.